While everyone's experience with the LASIK procedure may be slightly different, surgeons have guidelines and recommendations to follow for a reason. Knowing what is to be expected of you, as well as what will happen with your eyesight after surgery, will make a big difference in enjoying the benefits LASIK has to offer. 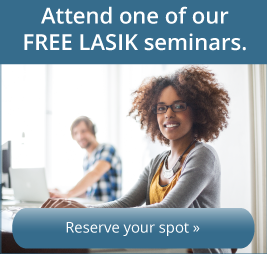 When considering undergoing the LASIK procedure, you will want to discuss options thoroughly with our refractive coordinator and your surgeon to learn as much as you can about what is involved. As a patient, it is important that you have a clear understanding of the surgery, the procedure's advantages and risks, and what to expect after the procedure is complete. Since LASIK at the LASIK Institute at Illinois Eye Center is performed on Fridays, most patients are able to return to work and other normal activities after a weekend of "taking it easy". It is recommended that you go to sleep right after the procedure to reduce any post-operative irritation. Your surgeon will provide you with a sleep aid. When you wake up, you should already notice improved vision. There is usually little to no post-operative discomfort after LASIK surgery, though follow-up exams during recovery are required to ensure that your eyes heal properly. Learn more about the LASIK procedure today by downloading our free eBook, Is LASIK Right For Me?